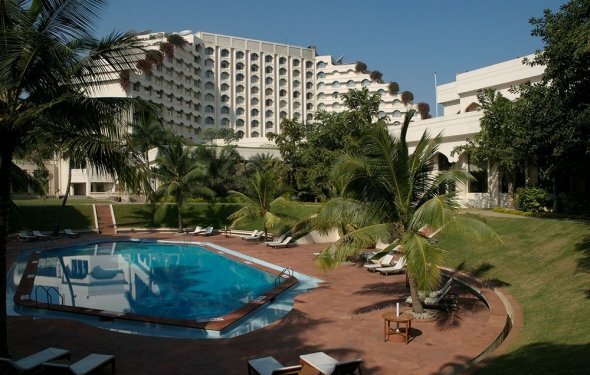 5.5 km from Secunderabad Railway Station, 34.3 km from Rajiv Gandhi International Airport, Conference halls, Boardrooms, Fitness centre, Outdoor swimming pool, 2 Restaurants, Bar Vivanta by Taj Begumpet is a luxurious 5 star hotel, located just a few minutes drive from Secunderabad Railway Station. The hotel offers spacious and well-furnished rooms that are divided into four types- Premium Indulgence, Superior Charm, Deluxe Allure Suite and Presidential Nirvana Suite. In-room amenities include television, electronic safe and internet connectivity. Guests staying in suites with a private sitting/dining area get access to the Rhythm- the on-site lounge. With 8, 600 sq ft of conference space, two banquet halls and a boardroom, this hotel serves as an ideal venue for hosting business events and parties. A well-equipped fitness centre, spa and an outdoor swimming pool are other important features of the hotel. Additionally, the hotel provides free Wi-Fi upto 2 devices. The Grill and Viva are two on-site restaurants offering a variety of mouth-watering delicacies. To enjoy Thai specialities, try Thai Pavilion. Step in Tease- to sip exotic wines, cocktails and other spirits. Lawn and poolside dining facilities are also available. Do not miss to try mouth-watering Shaslik, Rotisserie and Brochette grills by Chef Rajeev Janveja at The Grill. Parvathy Omanakuttan (born December 20, 1987) is an Indian model and actress who was crowned Miss India World in 2008 and later became first runner-up as Miss World Asia & Oceania at the Miss World 2008 competition.